Do you think they will stay more than two months? Six months? One year? Hiring the right employee and committing to an effective onboarding program will dramatically reduce turnover and improve job performance. Let Scott Human Resources show you how. Every business owner makes countless important decisions every day, but no decision has the potential to impact your business as much as hiring. Hiring the right person will help your business meet its goals, exceed customer expectations and give you the peace of mind to schedule a much-needed vacation. Hiring the right employee and clearly communicating expectations reduces turnover and improves job performance. Hiring the wrong person wastes valuable time and energy, causes dissatisfied customers, disgruntled employees and requires your daily attention and management. Because hiring is so important, Scott Human Resources believes in empowering you, the business owner or manager, in making the right hire. We will teach you how to hire successfully by enhancing recruitment processes, background checks, pre-employment assessments and improve interviewing techniques and your business will benefit from this education. Any time you need to hire in the future, you will have the tools you need. Onboarding, Training, Orientation. No matter what you call it, the process where a new employee learns how to succeed at your organization is vitally important. Research shows that it takes a new employee one to two years to truly get accustomed to a new organization and role. During that time they need frequent communication, structured trainings and the ability to ask questions and provide feedback. Very few organizations have structured trainings that last beyond the first two weeks, not to mention six months! Leaving this process to chance increases the likelihood that your new hires will fail to connect with their purpose and your business mission. Disengagement leads to poor work and turnover. Scott Human Resources can help you create a successful on-boarding process that will easily move your eager new hires to experienced, contributing employees. Scott Human Resources works with many clients to create their custom hiring and onboarding processes. Meet with a human resources expert to learn how to optimize and streamline your hiring process while reducing turnover with an effective onboarding program. Complete the form below or call 785-272-5410 to schedule your free initial meeting with one of Scott Human Resources’ senior consultants today. Reduce confusion by establishing reporting structures. We can update or create organizational charts customized for your business to aid proper employee communication channels. Of course a well-written job description will help the right applicants find your position and speed up your hiring process, but did you know that a solid job description is your first defense against a lawsuit? Clearly outlining expectations and management structure can be helpful with many legal issues, but it must be done before problems arise. We can review and create job descriptions to guide performance and provide legal compliance. Complete this form and Scott Human Resources will contact you soon! Learn how to hire successfully with effective HR practices and a clear vision of your ideal candidate. 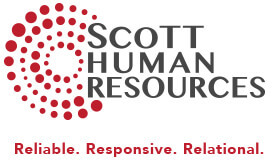 Ask Scott Human Resources for recommendations on improving recruitment today. Training, orientation or onboarding. Whatever you call it, it has a huge impact on your employees. Studies have shown that a well-designed training program can turn a new hire into a dedicated employee, reducing the cost of turnover. Successful onboarding in one of the most effective weapons in your arsenal.